Get your game on with this portable basketball system from Lifetime. The 1512 goal comes with a 44" black Fusion acrylic backboard and a Slam-it rim. 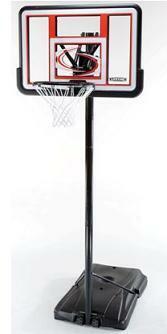 The powder coated and rust resistant pole (3 piece) is 3" in diameter and includes the Quick Adjust mechanism which uses a broomstick to raise and lower the backboard. Once assembled, all you have to do is fill the 28 gallon Courtside Base with sand or water and your ready to play some basketball. Includes 30-day money back guarantee if your are not completely satisfied. Quick Adjust mechanism - Use broomstick to raise and lower backboard. Adjusts from 7.5 to 10 high in 6" increments. 28 gallon portable base fills with sand or water. Competitive Edge Products, Inc. is an authorized retailer of the Lifetime 1512 Portable Basketball Hoop System. 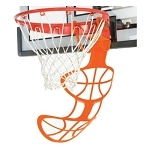 We also carry Lifetime In Ground Basketball Systems and other Basketball Accessories. Need a ball? Check out the basketballs we carry.